Page 51 of Book IX from the Florentine Codex. The text is in Nahuatl; World Digital Library. 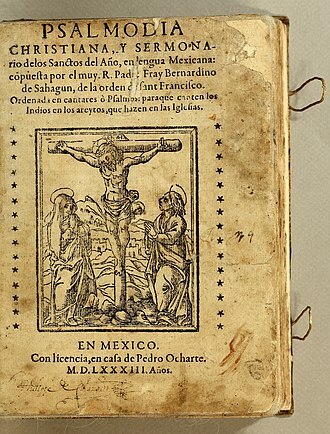 The Florentine Codex is a 16th-century ethnographic research study in Mesoamerica by the Spanish Franciscan friar Bernardino de Sahagún. Sahagún originally titled it: La Historia Universal de las Cosas de Nueva España (in English: The Universal History of the Things of New Spain). After a translation mistake, it was given the name Historia general de las Cosas de Nueva España. The best-preserved manuscript is commonly referred to as the Florentine Codex, as the codex is held in the Laurentian Library of Florence, Italy. In partnership with Nahua men who were formerly his students at the Colegio de Santa Cruz de Tlatelolco, Sahagún conducted research, organized evidence, wrote and edited his findings. He worked on this project from 1545 up until his death in 1590. The work consists of 2,400 pages organized into twelve books; more than 2,000 illustrations drawn by native artists provide vivid images of this era. It documents the culture, religious cosmology (worldview) and ritual practices, society, economics, and natural history of the Aztec people. It has been described as "one of the most remarkable accounts of a non-Western culture ever composed." The Americans Charles E. Dibble and Arthur J. O. Anderson were the first to translate the Codex from Nahuatl to English, in a project that took 30 years to complete. 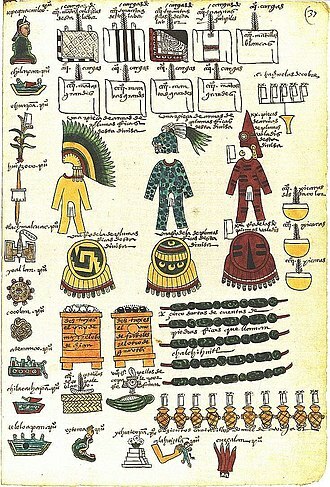 In 2012 high-resolution scans of all volumes of The Florentine Codex, in Nahuatl and Spanish, with illustrations, were added to the World Digital Library. 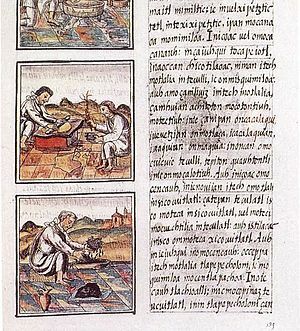 Historia general de las cosas de Nueva España (original from the Biblioteca Medicea Laurenziana). The three bound volumes of the Florentine Codex are found in the Biblioteca Medicea-Laurenziana, Palat. 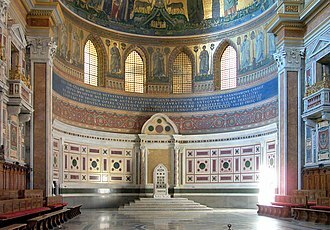 218-220 in Florence, Italy, with the title Florentine Codex chosen by its English translators, Americans Arthur J.O. Anderson and Charles Dibble, following in the tradition of nineteenth-century Mexican scholars Francisco del Paso y Troncoso and Joaquín García Icazbalceta. The manuscript became part of the collection of the library in Florence at some point after its creation in the late sixteenth century. 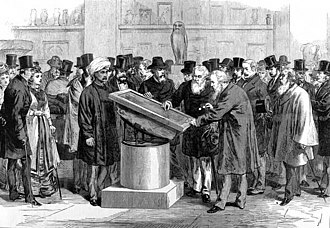 It was not until the late eighteenth century that scholars become aware of it, when the bibliographer Angelo Maria Bandini published a description of it in Latin in 1793. The work became more generally known in the nineteenth century, with a description published by P. Fr. Marcelino de Civezza in 1879. The Spanish Royal Academy of History learned of this work and, at the 5th meeting of the International Congress of Americanists, the find was announced to the larger scholarly community. In 1888 German scholar Eduard Seler presented a description of the illustrations at the 7th meeting of the International Congress of Americanists. Mexican scholar Francisco del Paso y Troncoso received permission in 1893 from the Italian government to copy the alphabetic text and the illustrations. The three-volume manuscript of the Florentine Codex has been intensely analyzed and compared to earlier drafts found in Madrid. The Tolosa Manuscript (Códice Castellano de Madrid) was known in the 1860s and studied by José Fernando Ramírez The Tolosa Manuscript has been source for all published editions in Spanish of the Historia General. The English translation of the complete Nahuatl text of all twelve volumes of the Florentine Codex was a decades-long work of Arthur J.O. Anderson and Charles Dibble, an important contribution to the scholarship on Mesoamerican ethno-history. In 1979 the Mexican government published a full-color, three-volume facsimile of the Florentine Codex in a limited edition of 2,000, allowing scholars to have easier access to the manuscript. The Archivo General de la Nación (Dra. Alejandra Moreno Toscano, director) supervised the project that was published by the Secretariat of the Interior (Prof. Enrique Olivares Santana, Secretary). The 2012 World Digital Library high-resolution digital version of the manuscript makes it fully accessible online to all those interested in this source for Mexican and Aztec history. The missionary Sahagún had the goal of evangelizing the indigenous Mesoamerican peoples, and his writings were devoted to this end. He described this work as an explanation of the "divine, or rather idolatrous, human, and natural things of New Spain." He compared its body of knowledge to that needed by a physician to cure the "patient" suffering from idolatry. 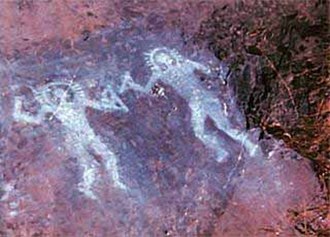 To describe and explain ancient Indigenous religion, beliefs, practices, deities. This was to help friars and others understand this "idolatrous" religion in order to evangelize the Aztecs. To create a vocabulary of the Aztec language, Nahuatl. This provides more than definitions from a dictionary, as it gives an explanation of their cultural origins, with pictures. This was to help friars and others learn Nahuatl and to understand the cultural context of the language. To record and document the great cultural inheritance of the Indigenous peoples of New Spain. Sahagún conducted research for several decades, edited and revised his work over several decades, created several versions of a 2,400-page manuscript, and addressed a cluster of religious, cultural and nature themes. Copies of the work were sent by ship to the royal court of Spain and to the Vatican in the late 16th century to explain Aztec culture. The Copies of the work were essentially lost for about two centuries, until a scholar rediscovered it in the Laurentian Library (Biblioteca Medicea Laurenziana) an archive library in Florence, Italy. 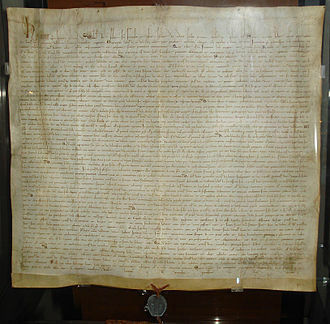 The Spanish also had earlier drafts in their archives. A scholarly community of historians, anthropologists, art historians, and linguists has since been investigating Sahagún's work, its subtleties and mysteries, for more than 200 years. An illustration of the "One Flower" ceremony, from the 16th-century Florentine Codex. The two drums are the teponaztli (foreground) and the huehuetl (background). The Florentine Codex is a complex document, assembled, edited, and appended over decades. Essentially it is three integral texts: (1) in Nahuatl; (2) a Spanish text; (3) pictorials. The final version of the Florentine Codex was completed in 1569. The Nahuatl Sahagún's goals of orienting fellow missionaries to Aztec culture, providing a rich Nahuatl vocabulary, and recording the indigenous cultural heritage are at times in competition within the work. The manuscript pages are generally arranged in two columns, with Nahuatl, written first, on the right and a Spanish gloss or translation on the left. Diverse voices, views, and opinions are expressed in these 2,400 pages, and the result is a document that is sometimes contradictory. Scholars have proposed several classical and medieval worldbook authors who inspired Sahagún, such as Aristotle, Pliny, Isidore of Seville, and Bartholomew the Englishman. These shaped the late medieval approach to the organization of knowledge. Book 12, the account of the conquest of Mexico from the point of view of the conquered of Tenochtitlan-Tlatelolco is the only strictly historical book of the Historia General. This work follows the organizational logic found in medieval encyclopedias, in particular the 19-volume De proprietatibus rerum of Sahagún's fellow Franciscan Friar Bartholomew the Englishman. 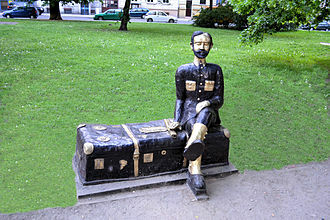 One scholar has argued that Bartholomew's work served as a conceptual model for Sahagún, although evidence is circumstantial. Both men present descriptions of the cosmos, society and nature of the late medieval paradigm. After the facsimile edition became available generally in 1979, the illustrations of the Florentine Codex could be analyzed in detail. 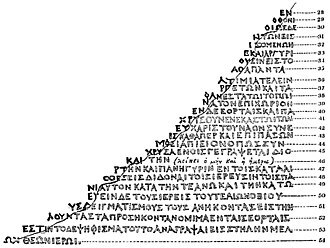 Previously, the images were known mainly through the black-and-white drawings found in various earlier publications, which were separated from the alphabetic text. The images in the Florentine Codex were created as an integral element of the larger opus. Although many of the images show evidence of European influence, a careful analysis by one scholar posits that they were created by "members of the hereditary profession of tlacuilo or native scribe-painter." The images were inserted in places in the text left open for them, and in some cases the blank space has not been filled. This strongly suggests that when the manuscripts were sent to Spain, they were as yet unfinished. The images are of two types, what can be called "primary figures" that amplify the meaning of the alphabetic texts, and "ornamentals" that were decorative. The majority of the nearly 2500 images are "primary figures" (approximately 2000), with the remainder ornamental. The figures were drawn in black outline first, with color added later. Scholars have concluded that several artists, of varying skill, created the images. Art historian Diana Magaloni Kerpel deduced that 22 artists worked on the images in the Codex. She did this by analyzing the different ways that forms of body were drawn, such as the eyes, profile, and proportions of the body. Additionally, Magaloni studied the different artists' treatments of lines. It is not clear what artistic sources the scribes drew from, but the library of the Colegio de Santa Cruz de Tlatelolco had European books with illustrations and books of engravings. European elements appear in the imagery, as well as pre-Conquest images done in the "native style". A number of the images have Christian elements, which Peterson has described as "Christian editorializing." The entirety of the Codex is characterized by the Nahua belief that the use of color activates the image and causes it to embody the true nature, or ixiptla, of the object or person depicted. For the Aztecs, the true self or identity of a person or object was shown via the external layer, or skin. Imparting color onto an image would change it so that it was given the identity of what it was portraying. Color was also used as a vehicle to impart knowledge that worked in tandem with the image itself. The Gods. Deals with gods worshipped by the natives of this land, which is New Spain. The Ceremonies. Deals with holidays and sacrifices with which these natives honored their gods in times of infidelity. The Origin of the Gods. About the creation of the gods. The Soothsayers. About Indian judiciary astrology or omens and fortune-telling arts. The Omens. Deals with foretelling these natives made from birds, animals, and insects in order to foretell the future. 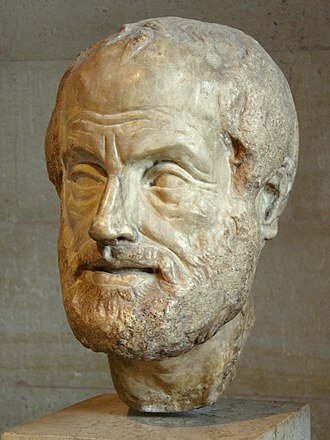 Rhetoric and Moral Philosophy. About prayers to their gods, rhetoric, moral philosophy, and theology in the same context. The Sun, Moon and Stars, and the Binding of the Years. Deals with the sun, the moon, the stars, and the jubilee year. Kings and Lords. About kings and lords, and the way they held their elections and governed their reigns. The Merchants. About long-distance elite merchants, pochteca, who expanded trade, reconnoitered new areas to conquer, and agents-provocateurs. The People. 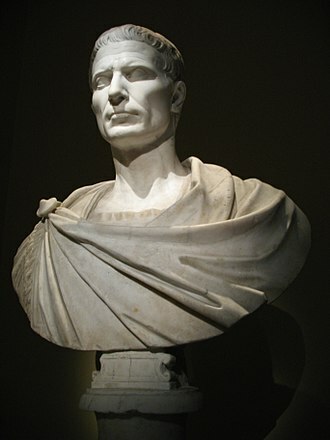 About general history: it explains vices and virtues, spiritual as well as bodily, of all manner of persons. Earthly Things. About properties of animals, birds, fish, trees, herbs, flowers, metals, and stones, and about colors. The Conquest. About the conquest of New Spain from the Tenochtitlan-Tlatelolco point of view. Sahagún was among the first people to develop an array of strategies for gathering and validating knowledge of indigenous New World cultures. Much later, the discipline of anthropology would later formalize these as ethnography. This is the scientific research strategy to document the beliefs, behavior, social roles and relationships, and worldview of another culture, and to explain these within the logic of that culture. Ethnography requires scholars to practice empathy with persons very different from them, and to try to suspend their own cultural beliefs in order to enter into, understand, and explain the worldview of those living in another culture. Sahagún systematically gathered knowledge from a range of diverse persons (now known as informants in anthropology), who were recognized as having expert knowledge of Aztec culture. He did so in the native language of Nahuatl, while comparing the answers from different sources of information. He sought out different types of informants, including women (which was unusual). Some passages appear to be the transcription of spontaneous narration of religious beliefs, society or nature. Other parts clearly reflect a consistent set of questions presented to different people designed to elicit specific information. Some sections of text report Sahagún's own narration of events or commentary. He used the native language of Nahuatl. 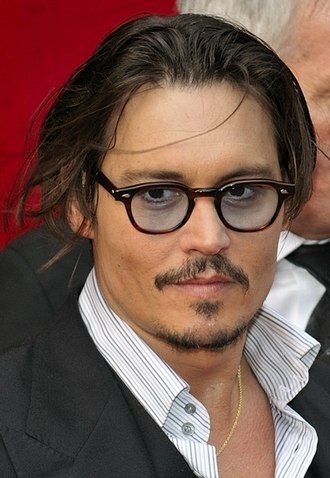 He elicited information of elders, cultural authorities publicly recognized as most knowledgeable. He adapted the project to the ways in which Aztec culture recorded and transmitted knowledge. He used the expertise of his former students at the Colegio de Santa Cruz de Tlatelolco, whom he credited by name. He attempted to capture the totality or complete reality of Aztec culture on its own terms. He structured his inquiry by using questionnaires, but also could adapt to using more valuable information shared with him by other means. He attended to the diverse ways that diverse meanings are transmitted through Nahuatl linguistics. He undertook a comparative evaluation of information, drawing from multiple sources, in order to determine the degree of confidence with which he could regard that information. He collected information on the conquest of Mexico from the point of view of the Tenochtitlan-Tlatelolco, who had been defeated. 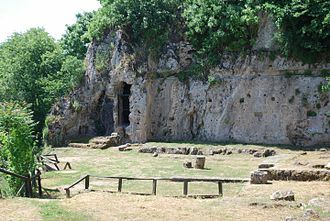 These methodological innovations substantiate historians' claim that Sahagún was the first anthropologist. Most of the Florentine Codex is alphabetic text in Nahuatl and Spanish, but its 2,000 pictures provide vivid images of sixteenth-century New Spain. Some of these images directly support the alphabetic text; others are thematically related; others are for seemingly decorative purposes. Some are colorful and large, taking up most of a page; others are black and white sketches. The pictorial images offer remarkable detail about life in New Spain, but they do not bear titles, and the relationship of some to the adjoining text is not always self-evident. 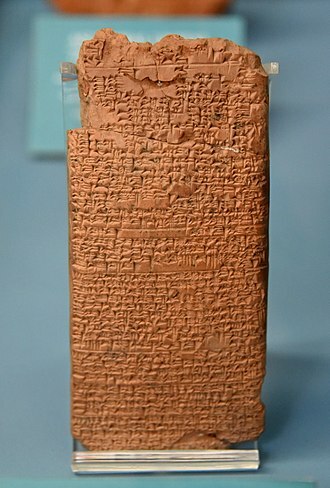 They can be considered a "third column of language" in the manuscript. Several different artists' hands have been identified, and many questions about their accuracy have been raised. The drawings convey a blend of Indigenous and European artistic elements and cultural influences. Many passages of the texts in the Florentine Codex present descriptions of like items (e.g., gods, classes of people, animals) according to consistent patterns. Because of this, scholars have concluded that Sahagún used a series of questionnaires to structure his interviews and collect data. What are the titles, the attributes, or the characteristics of the god? What ceremonies were performed in his honor? 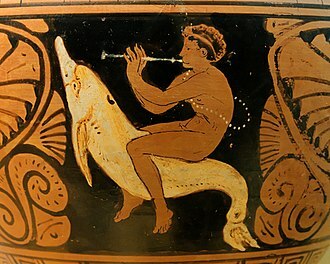 What is the (trader, artisan) called and why? What particular gods did they venerate? How were their gods attired? How did each occupation work? This book also described some other indigenous groups in Mesoamerica. What is the name of the plant (plant part)? How is the medicine prepared? 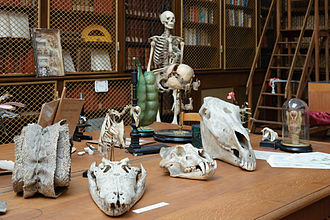 The text in this section provides very detailed information about location, cultivation, and medical uses of plants and plant parts, as well as information about the uses of animal products as medicine. The drawings in this section provide important visual information to amplify the alphabetic text. 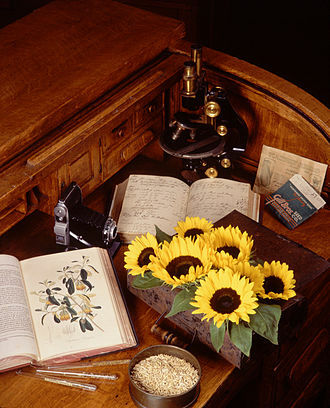 The information is useful for a wider understanding of the history of botany and the history of zoology. 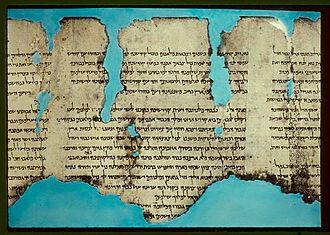 Scholars have speculated that Sahagún was involved in the creation of the Badianus Manuscript, an herbal created in 1552 that has pictorials of medicinal plants and their uses. Although this was originally written in Nahuatl, only the Latin translation has survived. Book Eleven, "Earthly Things," has the most text and approximately half of the drawings in the codex. The text describes it as a "forest, garden, orchard of the Mexican language." It describes the Aztec cultural understanding of the animals, birds, insects, fish and trees in Mesoamerica. What animals does it resemble? Why does it receive this name? What habits does it have? What sounds does it make? Plants and animals are described in association with their behavior and natural conditions or habitat. The Nahua presented their information in a way consistent with their worldview. For modern readers, this combination of ways of presenting materials is sometimes contradictory and confusing. Other sections include data on minerals, mining, bridges, roads, types of terrain, and food crops. The Florentine Codex is one of the most remarkable social science research projects ever conducted. It is not unique as a chronicle of encountering the New World and its peoples, for there were others in this era. Sahagún's methods for gathering information from the perspective within a foreign culture were highly unusual for this time. He reported the worldview of people of Central Mexico as they understood it, rather than describing the society exclusively from the European perspective. "The scope of the Historia's coverage of contact-period Central Mexico indigenous culture is remarkable, unmatched by any other sixteenth-century works that attempted to describe the native way of life." Foremost in his own mind, Sahagún was a Franciscan missionary, but he may also rightfully be given the title as Father of American Ethnography. Bernardino de, Sahagun; Kupriienko, Sergii (2013) . General history of the affairs of New Spain. Books X-XI: Aztec's Knowledge in medicine and botany. Kyiv: Видавець Купрієнко С.А. ISBN 978-617-7085-07-1. Retrieved 4 September 2013. ^ Bernardino de Sahagún, Florentine Codex: General History of the Things of New Spain (Translation of and Introduction to Historia General de Las Cosas de La Nueva España; 12 Volumes in 13 Books ), trans. Charles E. Dibble and Arthur J. O Anderson (Salt Lake City: University of Utah Press, 1950-1982). Images are taken from Fray Bernardino de Sahagún, The Florentine Codex. Complete digital facsimile edition on 16 DVDs. Tempe, Arizona: Bilingual Press, 2009. Reproduced with permission from Arizona State University Hispanic Research Center. ^ Ann Bardsley and Ursula Hanly, U Distinguished Professor of Anthropology Professor Charles Dibble Dies, 5 Dec. 2002, University of Utah. Accessed 7 July 2012. ^ "World Digital Library Adds Florentine Codex". News Releases - Library of Congress. 2012-10-31. Retrieved 2012-11-12. ^ Dibble, "Sahagún's Historia", p. 16. ^ Dibble, "Sahagún's Historia," p. 16. ^ Dibble, "Sahagún's Historia" p. 16. ^ Dibble, "Sahagún's Historia", p. 17. 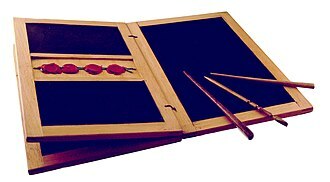 ^ José Fernando Ramírez, "Códices majicanos de fr. Bernardino de Sahagún." Boletín de la Real Academia de la Historia, Vol. VI (Madrid 1885), pp. 85-124. ^ Dibble, "Sahagún's Historia" p. 21. ^ Arthur J.O. Anderson and Charles Dibble, Florentine Codex: General History of the Things of New Spain. Salt Lake City: University of Utah Press 1950-1982. ^ H. B. Nicholson, "Fray Bernardino De Sahagún: A Spanish Missionary in New Spain, 1529-1590," in Representing Aztec Ritual: Performance, Text, and Image in the Work of Sahagún, ed. Eloise Quiñones Keber (Boulder: University of Colorado Press, 2002). Prologue to Book XI, Introductory Volume, page 46. ^ Alfredo López Austin, "The Research Method of Fray Bernardino De Sahagún: The Questionnaires," in Sixteenth-Century Mexico: The Work of Sahagún, ed. Munro S. Edmonson (Albuquerque: University of New Mexico Press, 1974). Page 121. ^ Edmonson, M. S. (Ed.) (1974) Sixteenth-century Mexico: The Work of Sahagún, Albuquerque, New Mexico, University of New Mexico Press. ^ a b For a history of this scholarly work, see Miguel León-Portilla, Bernardino De Sahagún: The First Anthropologist (Norman: University of Oklahoma Press, 2002). ^ Howard F. Cline, "Evolution of the Historia General" in Handbook of Middle American Indians, Guide to Ethnohistorical Sources, Part 2, Austin: University of Texas Press, 1973, pp. 189-207. ^ a b c López Austin, "The Research Method of Fray Bernardino De Sahagún: The Questionnaires." ^ D. Robertson, "The Sixteenth Century Mexican Encyclopedia of Fray Bernardino de Sahagún," Journal of World History 4 (1966). ^ Eloise Quiñones Keber, "Reading Images: The Making and Meaning of the Sahaguntine Illustrations," in The Work of Bernardino de Sahagún: Pioneer Ethnographer of Sixteenth-Century Aztec Mexico. J. Jorge Klor de Alva et al. eds. Albany: Institute for Mesoamerican Studies. SUNY Albany 1988, p.202. ^ Jeanette Favrot Peterson. "The Florentine Codex Imagery and the Colonial Tlacuilo," in The Work of Bernardino de Sahagún: Pioneer Ethnographer of Sixteenth-Century Aztec Mexico, J. Jorge Klor de Alva et al. eds. Albany: Institute for Mesoamerican Studies. SUNY Albany 1988, p.273. ^ Peterson, "The Florentine Codex Imagery," p. 277. ^ Peterson, "The Florentine Codex Imagery," p. 273. ^ Peterson, "The Florentine Codex Imagery," p. 274. ^ Donald Robertson, Mexican Manuscript Painting of the Early Colonial Period. New Haven: Yale University Press 1959, p. 178. ^ Magaloni Kerpel, Diana (2014). The Colors of the New World. Los Angeles, California: Getty Research Institute. p. 27. ISBN 978-1-60606-329-3. ^ Peterson, "The Florentine Codex Imagery", p. 278. ^ Peterson, "The Florentine Codex Images," p. 279. ^ Robertson, Mexican Manuscript Painting, pp. 15-23. ^ Peterson, "The Florentine Codex Imagery," p. 293. ^ Magaloni Kerpel, Diana (2014). The Colors of the New World. Los Angeles, California: Getty Research Institute. ISBN 978-1-60606-329-3. ^ Bernardino de Sahagún, Florentine Codex: General History of the Things of New Spain (Translation of and Introduction to Historia General De Las Cosas De La Nueva España; 12 Volumes in 13 Books). ^ For analysis of the pictures and the artists, see several contributions to John Frederick Schwaller, ed., Sahagún at 500: Essays on the Quincentenary of the Birth of Fr. Bernardino de Sahagún (Berkeley: Academy of American Franciscan History, 2003). ^ Alfredo López Austin, "Sahagún's Work and the Medicine of the Ancient Nahuas: Possibilities for Study," in Sixteenth-Century Mexico: The Work of Sahagún, ed. Munro S. Edmonson (Albuquerque: University of New Mexico Press, 1974). The passage on human anatomy appears primarily intended to record vocabulary. The ethnobotanic section is an insertion into Book Eleven, and reads quite differently from the rest of this book. ^ Bernardino de Sahagún, Florentine Codex: General History of the Things of New Spain (Translation of and Introduction to Historia General de Las Cosas de la Nueva España; 12 Volumes in 13 Books), Prologue to Book XI, Introductory Volume, page 88. ^ Arthur J. O Anderson, "Sahagún: Career and Character," in Florentine Codex: Introductions and Indices, ed. Arthur J. O Anderson and Charles E. Dibble (Salt Lake City: University of Utah Press, 1982). Bartholomeus Anglicus was an early 13th-century scholastic scholar of Paris, a member of the Franciscan order. He was the author of the compendium De proprietatibus rerum, dated at 1240, bartholomew held senior positions within the church and was appointed Bishop of Łuków although he was not consecrated to that position. Little is known of Bartholomews early life and he is believed to have been born around the turn of the 13th century to unknown parents. The first record of him was in 1224 in Paris as a teacher, the work De proprietatibus rerum was written at the school of Magdeburg in Saxonia and intended for the use of students and the general public. Bartholomew carefully notes the sources for the included, although, at present. His annotations give an idea of the wide variety of works available to a medieval scholar. The original Latin work was translated into French in 1372 and a number of manuscripts of the Latin, the work was printed in numerous editions. John Trevisa produced an English translation in 1397, extracts were compiled by Robert Steele under the title Medieval Lore, an Epitome. A critical edition of Trevisas translation appeared in 1988, the work was organized in 19 books. Basil of Caesarea In Hexameron Bede, the work by which he was best known in the 13th century was not his History but the works on the Calendar, etc. Jean Beleth Bernard of Clairvaux Bestiarium, A collection of early myths on animals, there are many different forms of this work. 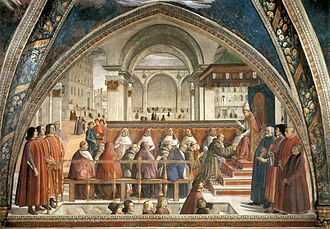 Boethius treatise on arithmetic Callisthenes pseudo, Alexander romance Cassiodorus De Septem Disciplinis Cato the Elder, On Agriculture Calcidius, constantine the African He wrote the Viaticum and the Pantegna He introduced Arab medicine into Europe through the School of Salerno. A Syriac astrologer, afterwards Bishop of Antioch, and Martyr in the Diocletian persecution, a Syrian commentator on Aristotle, who took refuge in Persia. 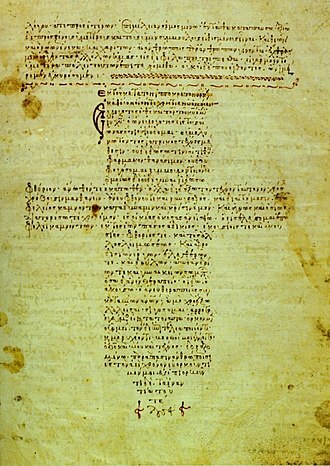 Author of a work on wonders quoted by Photius, pedanius Dioscorides Pseudo-Dionysius the Areopagite, De Coelesti Hierarchia, and de divinis nominibus Aelius Donatus Grammarian. Fabius Planciades Fulgentius or Fulgentius of Ruspe grammarian, gilbertus Anglicus An English physician in France, wrote COMPENDIUM MEDICINAE. The World Digital Library is an international digital library operated by UNESCO and the United States Library of Congress. It aims to expand non-English and non-western content on the Internet, the WDL opened with 1,236 items. As of late 2015, it more than 12,000 items from nearly 200 countries. After almost 20 years without participation, the United States re-established its permanent delegation to the United Nations Educational, google Inc. became the first partner of this public–private partnership and donated $3 million to support development of the World Digital Library in 2005. Foremost was the belief that the World Digital Library should engage partners in planning the four project areas, technical architecture, governance. The participants formed working groups to address the challenges of each of the four project areas. The working groups presented their findings to the larger WDL group in July 2007, findings from this planning process were presented at the thirty-fourth session of the UNESCO General Conference in October 2007 in Paris, France. Nahuatl, known historically as Aztec, is a language or group of languages of the Uto-Aztecan language family. Varieties of Nahuatl are spoken by an estimated 1.5 million Nahua peoples, all Nahuan languages are indigenous to Mesoamerica. Nahuatl has been spoken in central Mexico since at least the seventh century CE and it was the language of the Aztecs who dominated what is now central Mexico during the Late Postclassic period of Mesoamerican history. This early literary language based on the Tenochtitlan variety has been labeled Classical Nahuatl, Nahuan languages are spoken in scattered communities, mostly in rural areas throughout central Mexico and along the coastline. There are considerable differences among varieties, and some are mutually unintelligible, Huasteca Nahuatl, with over one million speakers, is the most-spoken variety. They have all been subject to varying degrees of influence from Spanish, No modern Nahuan languages are identical to Classical Nahuatl, but those spoken in and around the Valley of Mexico are generally more closely related to it than those on the periphery. Nahuan languages exhibit a complex morphology characterized by polysynthesis and agglutination, through a very long period of coexistence with the other indigenous Mesoamerican languages, they have absorbed many influences, coming to form part of the Mesoamerican language area. Many words from Nahuatl have been borrowed into Spanish, and since diffused into hundreds of other languages, most of these loanwords denote things indigenous to central Mexico which the Spanish heard mentioned for the first time by their Nahuatl names. English words of Nahuatl origin include avocado, chili, atlatl, peyote, axolotl, as a language label, the term Nahuatl encompasses a group of closely related languages or divergent dialects within the Nahuan branch of the Uto-Aztecan language family. The Mexican Instituto Nacional de Lenguas Indígenas recognize 30 different individual varieties within the language group labeled Nahuatl, the Ethnologue recognizes 28 varieties with separate ISO codes. Sometimes the label is used to include the Pipil language of El Salvador, within Mexico the question of whether to consider individual varieties to be languages or dialects of a single language is highly political. He was influential in the inner circle of Sisebut, Visigothic king of Hispania. 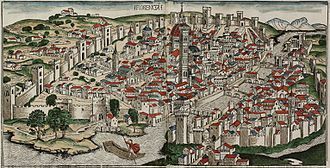 Like Leander, he played a prominent role in the Councils of Toledo, the Visigothic legislation that resulted from these councils influenced the beginnings of representative government. 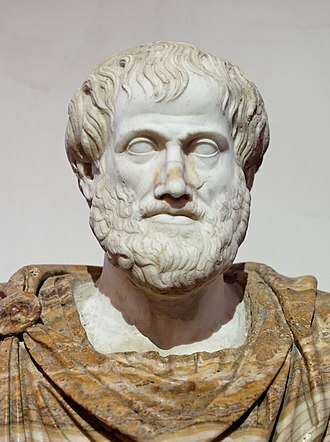 His fame after his death was based on his Etymologiae, an encyclopedia which assembled extracts of many books from classical antiquity that would have otherwise been lost. 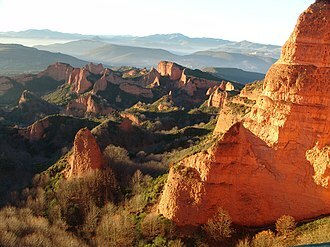 Isidore was probably born in Cartagena, Spain, a former Carthaginian colony, to Severianus, both Severianus and Theodora belonged to notable Hispano-Roman families of high social rank. His parents were members of a family who were instrumental in the political-religious manoeuvring that converted the Visigothic kings from Arianism to Catholicism. A younger brother, Saint Fulgentius of Cartagena, served as the Bishop of Astigi at the start of the new reign of the Catholic King Reccared and his sister, Saint Florentina, served God as a nun and allegedly ruled over forty convents and one thousand consecrated religious. This claim seems unlikely, given the few functioning monastic institutions in Iberia during her lifetime, Isidore received his elementary education in the Cathedral school of Seville. In this institution, the first of its kind in Iberia, a body of learned men including Archbishop Saint Leander of Seville taught the trivium and quadrivium, Saint Isidore applied himself to study diligently enough that he quickly mastered Latin, and acquired some Greek, and Hebrew. Two centuries of Gothic control of Iberia incrementally suppressed the ancient institutions, classic learning, the associated culture entered a period of long-term decline. The ruling Visigoths nevertheless showed some respect for the trappings of Roman culture. Arianism meanwhile took deep root among the Visigoths as the form of Christianity that they received, scholars may debate whether Isidore ever personally embraced monastic life or affiliated with any religious order, but he undoubtedly esteemed the monks highly. After the death of Saint Leander of Seville on 13 March 600 or 601, on his elevation to the episcopate, he immediately constituted himself as protector of monks. He used all available religious resources toward this end and succeeded, Isidore practically eradicated the heresy of Arianism and completely stifled the new heresy of Acephali at its very outset. Archbishop Isidore strengthened religious discipline throughout his See, Archbishop Isidore used resources of education to counteract increasingly influential Gothic barbarism throughout his episcopal jurisdiction. His quickening spirit animated the educational movement centered on Seville, Saint Isidore introduced Aristotle to his countrymen long before the Arabs studied Greek philosophy extensively. 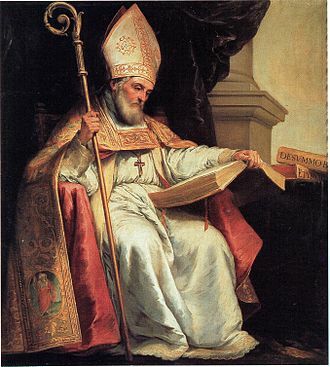 In 619, Saint Isidore of Seville pronounced anathema against any ecclesiastic who in any way should molest the monasteries, through the enlightened statecraft of his two brothers, the Councils of Seville and Toledo emanated Visigothic legislation which influenced the beginnings of representative government. The Acts of the Council fully set forth the nature of Christ, countering the conceptions of Gregory, based on a few surviving canons found in the Pseudo-Isidorian Decretals, Saint Isidore is known to have presided over an additional provincial council around 624. Pochteca were professional, long-distance traveling merchants in the Aztec Empire. They were a small, but important class as they not only facilitated commerce, the trade or commerce was referred to as pochtecayotl. The pochteca traveled outside the empire to trade with neighboring lands throughout Mesoamerica, because of their extensive travel and knowledge of the empire, pochteca were often employed as spies. 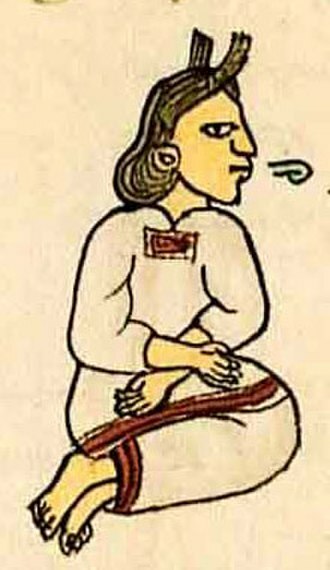 Pochteca occupied a high status in Aztec society, below the noble class, the pochteca were responsible for providing the materials that the noble class used to display their wealth. 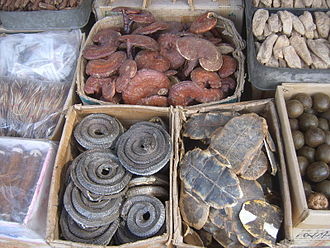 These materials were obtained from foreign sources. 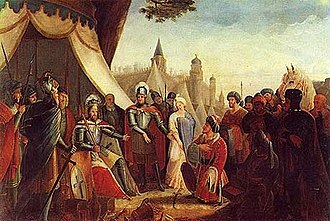 The pochteca acted as agents for the nobility by selling the surplus tribute that had been bestowed on the noble, the pochteca traded the excess tribute in the marketplace or carried it to other areas to exchange for trade goods. Due to the success of the pochteca, many of these merchants became as wealthy as the noble class, trading expeditions often left their districts late in the evening, and their wealth was only revealed within their private guildhalls. Although politically and economically powerful, the pochteca strove to avoid undue attention, the merchants followed their own laws in their own calpulli, venerating their god, The Lord Who Guides, an aspect of Quetzalcoatl. Eventually the merchants were elevated to the rank of the warriors of the military orders, in the Valley there were four levels of market, The great market of Tlatelolco which met daily. The markets of Texcoco and Xochimilco, the Macuiltianquiztli - every five-days markets of the city-states Huitzilopocho, Cuautitlán, Mixcoac, Huexotla, Cóatlichan and Chalco. The markets of the towns and villages. Some of the cities were famous for specialized markets, Texcoco sold ceramics, acolman specialized in dogs and food animals. Tepepulco sold birds, important for their feathers, Azcapotzalco was a trading hub and controlled all major markets and trade routes. The highest official of the pochteca in Tenochtitlán was the Pochtecatlailotlac, the Merchant-Arbiter who sat as one of the judges in the Tlacxitlan, the highest court of law. Tlatelolco was a pre-Columbian Nahua altepetl in the Valley of Mexico. Its inhabitants were known as Tlatelolca, the Tlatelolca were a part of the Mexica ethnic group, a Nahuatl speaking people who arrived in what is now central Mexico in the 13th century. 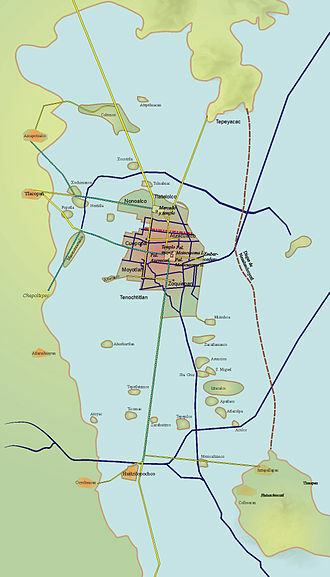 They settled on an island in Lake Texcoco where they founded their city on the northern part — the other Mexica group, the Tenochca, founded their city Tenochtitlan on the southern part. The city was tied with its sister city, which was largely dependent on the market of Tlatelolco. The Tlatelolco archaeological site is an excavation site in Mexico City. 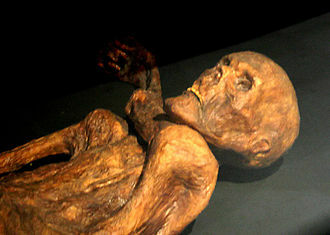 In February 2009, the discovery of a grave with 49 human bodies was announced by archaeologists. The grave is considered unusual because the bodies are laid out in ritual fashion, in 1337, thirteen years after the foundation of Tenochtitlan, the Tlatelolca declared themselves independent from the Tenochca and inaugurated their first independent Tlatoani. 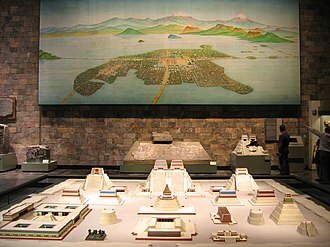 Under the king Cuacuauhpitzahuac, the first two stages of the Main Pyramid of Tlatelolco were constructed, under Tlacateotl, the Tlatelolca assisted the Tenochca in the war against the Tepanecs, shortly thereafter, the first war between the Tenochca and Tlatelolca erupted. 1897 portrait of Eduard Seler and his wife Caecilie Seler-Sachs whose inherited fortune turned Eduard from a penniless lecturer into a traveling scholar. Representation of a new fire ceremony (Codex Borbonicus, p.34). Aztec glyphs for the member-states of the Aztec Triple Alliance: Texcoco (left), Tenochtitlan (middle), and Tlacopan (right). Stages of Life by Bartholomeus Anglicus (1486).